I found myself with time on my hands after work tonight. DH had to work late so after a quick dinner from Panera takeout, I decided to sew up those fitting adjustments needed for New Look 6230. I also took side seams from 5/8 to 3/8. I am happier with the neckline fit. I decided to post photos of the adjusted neckline. With the neckband to attach next I will be happier with this fit. 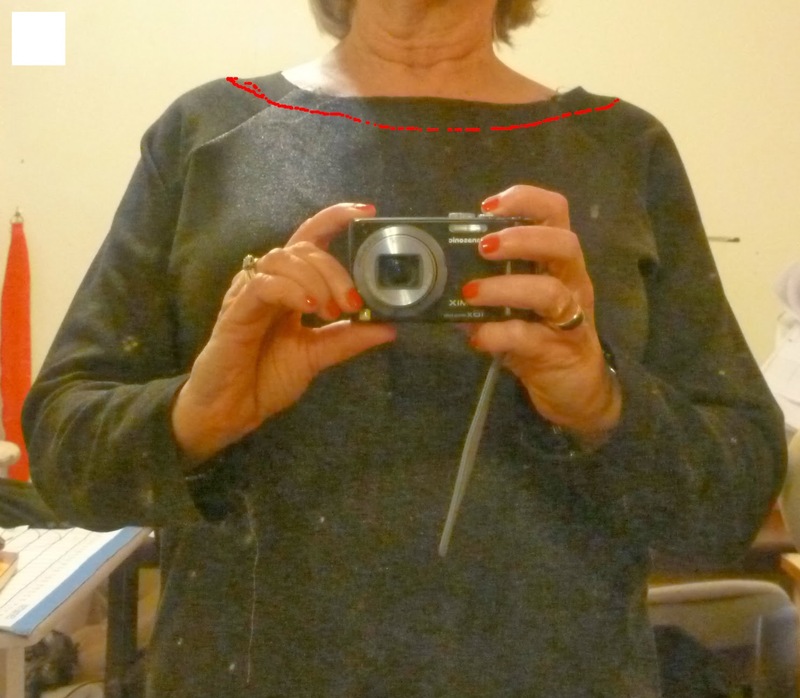 The red line drawn above is intended to give you an idea of where the neckline was falling before the adjustments. It truly was almost falling off the shoulder. The specs are from my mirror-fire the housekeeper! That would be me. If I was young like the model on the envelope then probably lower neckline would work. But this was really large. I am happy that I was able to save this as I really do like the fabric; unfortunately it is not showing up so well in the photos. Sunday AM: I have almost finished the New Look top. I have a few fitting adjustments to make at the neckline. I made a pattern adjustment to that area prior to cutting out. I raised the neckline an inch on the pattern pieces. 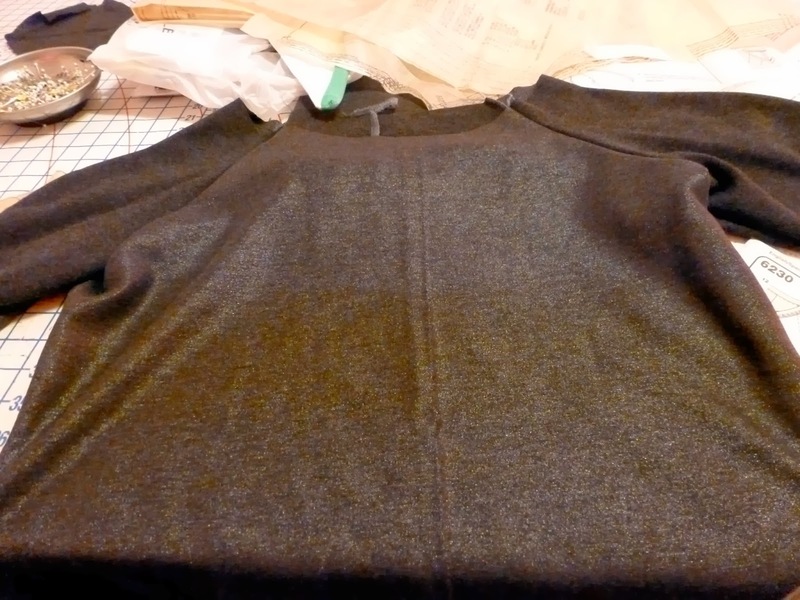 It is still rather wide; I pinned and will baste a deeper seam at the front and back sleeve to bodice seam lines and if necessary will take a deeper seam at center back. I basted the side seams at 5/8 inch but may have to reduce that to 3/8. The pattern notes 3/8 seam allowance at neckline and overall instructions state seam allowance is 5/8 unless noted on the pattern. I did not make a FBA and cut at size 16 from underarm to bodice bottom. 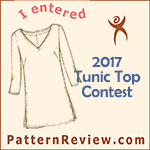 There were no finished measurements for waist and hip printed on the pattern piece only for bust; I went by the sizes noted on the envelope which are close to mine and even a little larger. My newest pattern acquisitions came this past week, thank you Mr Postman!!! I thought I could use this as the jumping off point to make a similar skirt; I don't have the models legs anymore so I will be adjusting so the split is noticeable but not NOTICEABLE! One of my favorite blogs is Sew & Style by Toy. She is always posting fashion styles which helps inspire me as well. She also has a YouTube site where she does a great job of sharing her sewing journey with a particular pattern. 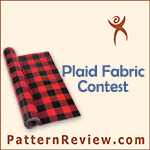 She recently made this pattern in a black ponte knit and a faux leather fabric. I have wanted to make this pattern for a month or more now. I cut out the pattern pieces this morning and pin fitted it for necessary adjustments. I have a knit fabric I acquired from Mood Fabrics last year. 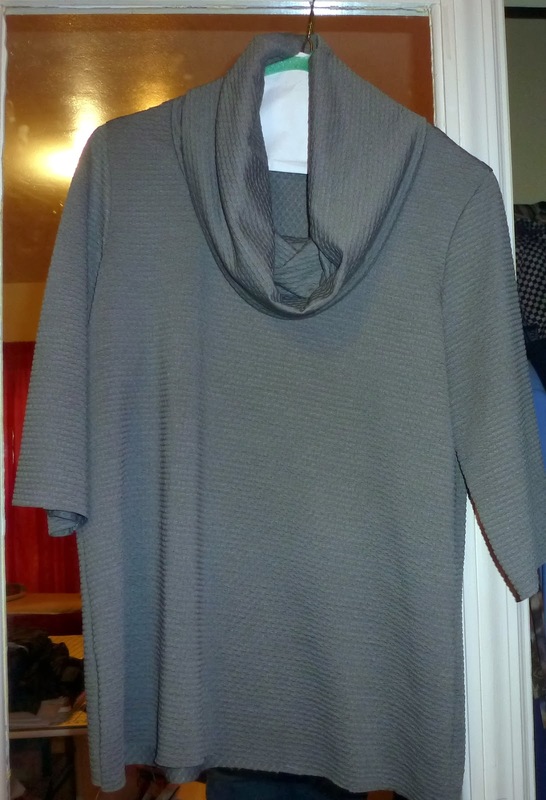 It is a grey metallic viscose knit with one side shiny and the other matte. I plan to use both sides for this top. 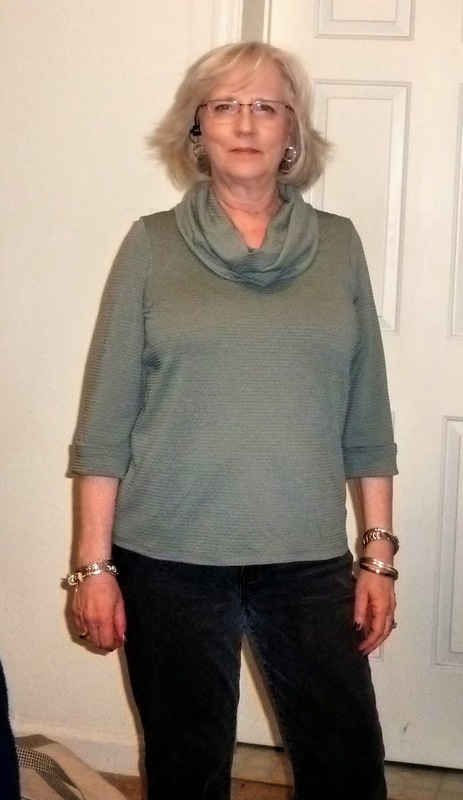 I have focused on knit tops lately as I really need to replace some tops I that have been in my closet for some time now and are getting worn out or I am tired of wearing them. After I complete this top, I plan to shift my attention to this Vogue pattern, a close fitting, lined dress. I have read reviews by a few others and I think I can eliminate the lining, though I do have some stretch linings in my stash. I think some others eliminated the zipper as well. This dress will become my March garment of the month. I completed M6796 this morning. I wanted to wear it today. 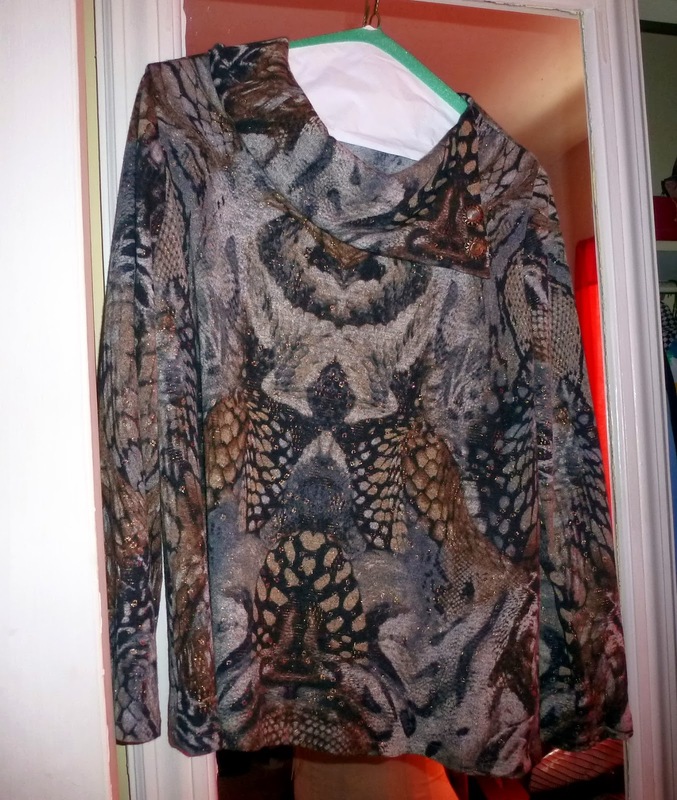 It is a great top for the colder weather using a sweater knit. As noted previously this is fabric from EOS. Here are a few photos of the top hanging once I had finished hemming it and give it a final press. I was not sure that I wanted to add buttons as I did not want the buttons to be a focal point. I want the fabric to be the focus. Searching through my button stash which needs beefing up, I found these buttons. I only had two and found that to be sufficient for this version of the top. DH and I had some errands to run since this is the first time in two days that we have been able to get out of the house and off our street since the 20+ inches of snow we had dumped on us for almost two days. I got him to take a few photos of me wearing. Can you see my car? I parked it next to my neighbors car in their driveway as I could not drive mine up our steep driveway. I can't see either car but they are there; they were covered with snow by the end of the day on Thursday. This was taken late afternoon on Thursday. Yesterday with the snow ending and snow starting to melt from the sun, here are the cars. Today they have finally plowed our street so we can finally get out of the neighborhood. Weather predicted for next weekend--in the 60's F. I am so ready for spring! 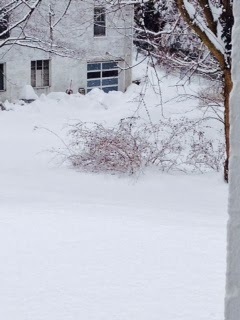 Wednesday and Thursday the Southwest area of Virginia where I live got hit with a heavy duty snow storm. We got 24 inches of snow. I know many of you in the Northeast region have had more than your share of snow. I have not been able to get out of my neighborhood to go to work yesterday and today. So I worked from home Thursday-got to love technology. Today was a vacation day of sorts as well as Valentines. My valentine and I spent the day shoveling snow out of our driveway and off of our vehicles. I did get some sewing in today and my February garment of the month is almost complete. My best sewing plans for Sunday did not happen. I woke up with a headache that just would not go away; then I had stomach ache and then chills. Ended up being rather sick and lost several hours for the day. All I can say is that the fabric is cut out, machines are on ready to go and hopefully will find some time before the weekend to do a little sewing. I hope your sewing weekend was a good one and will be roaming blogs to see your latest creations. I was able to rally and go back to work today. I hate my lost sewing time. I completed my third version of this top. I did not add the hem bands with this one and coverstitched the hem using a 5/8 hem allowance. I added an inch to the bottom when cutting out the fabric in order for it to be the length I wanted without the bands and after hemming. I also shortened the shoulder length by 1/4 inch and I think that is perfect for me and future versions of this top. I am going to give it a rest for now! Just finished cutting out M6796 and plan to sew it this afternoon. 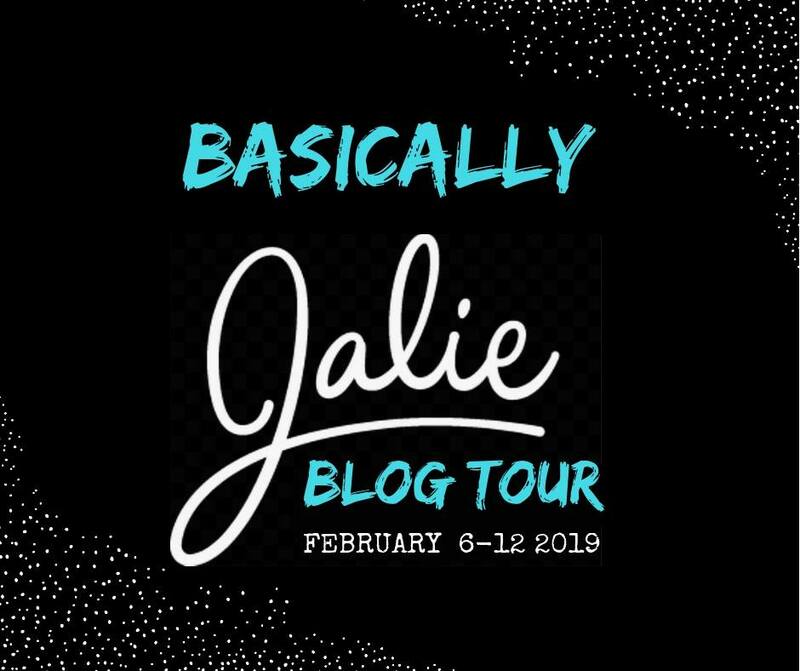 Two days on the road this past week and long business meetings yesterday, can make a girl go crazy! At least that is the case for this girl. I was so happy to leave work on Friday and to start the weekend. DH and I had dinner after doing a little bit of grocery shopping Friday evening. After putting up the groceries I went to the sewing room to finish the Renfrew 3 top. I attached the sleeve cuffs and then set up the coverstitch machine. I still have to hem the bodice as coverstitch and I were not working well together. I knew if I kept fiddling with the machine I would get cranky so decided to wait another day. I took advantage of a fabric sale from Mood earlier in the week. I was pleasantly surprised when I found in my mailbox yesterday a package with this new fabric. This was a quick turn around--thank you Mood! The fabric colors were not as I thought they would be and actually they are more of what I prefer. I know I will make some sort of blouse/top from this, just not sure which pattern I will use. It is a repeat design not a true border print. 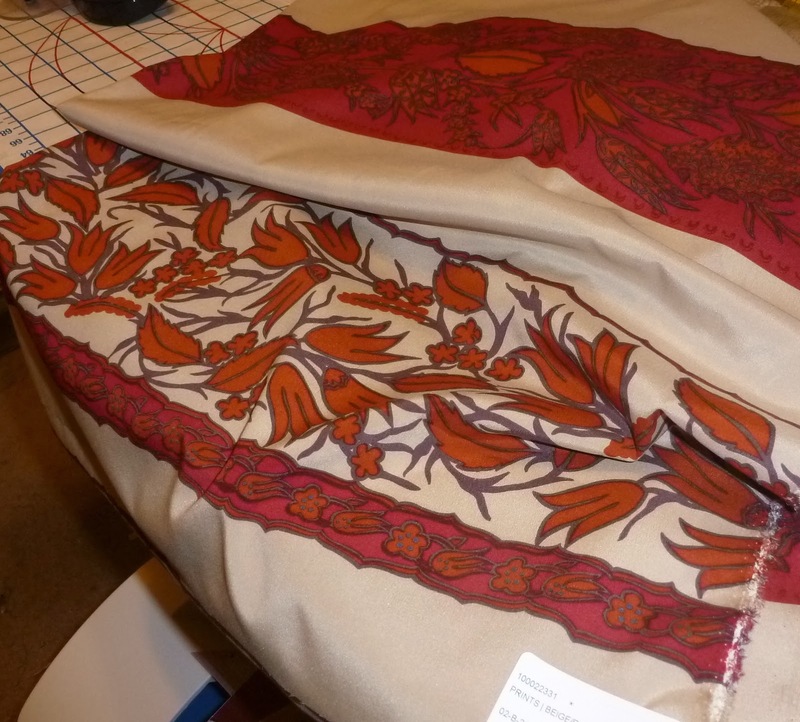 The fabric is a silk with lycra blend. 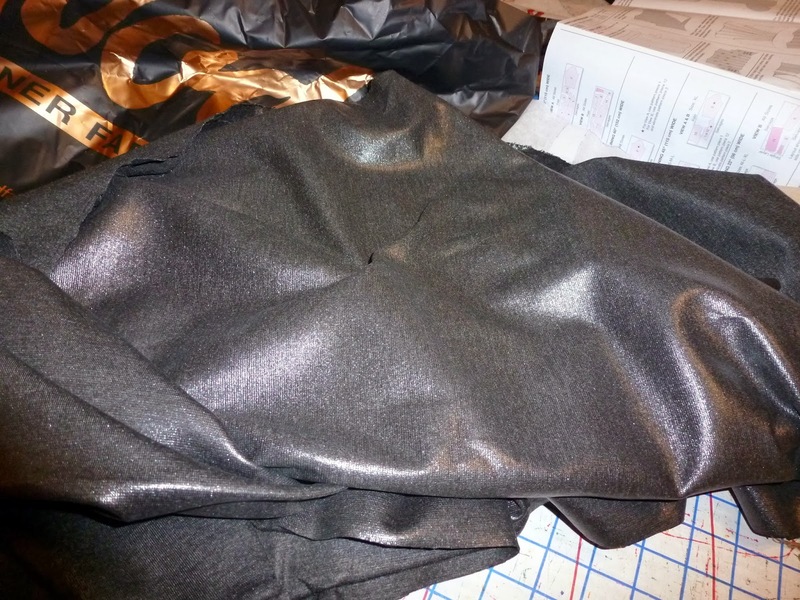 I also have two fabrics I got recently from Michael Levine in Los Angles. I forgot I had not taken photos of this fabric. Adding this to my to do list. I have made great progress on my third version of the Renfrew top. With this version I cut it an inch longer and decided that I would not add the hip band to this one, will coverstitch the hem. I did keep the sleeve cuffs; I still need to attach them. I took a close up of the neckline to provide a better view of the textured knit fabric. This knit has great stretch and recovery; it has been a very nice knit to sew. This is a knit I purchased from Waechters in Asheville, NC a few years ago. Since I have made two previous versions I felt that I could whip this up by serging all of the seams. Previously I stitched using the sewing machine, then edge finished the seams with serger. This definitely reduced sewing time.